Just when you thought you might be starting to understand Hamilton watches, they throw you a curve ball. I'm sure you've picked up on Hamilton's use of a "-B" on models where the movement was changed. A classic example is the Boulton and Boulton-B. The former has a 14/0 sized 982 movement and the latter has the 982's replacement, the 12/0s sized 753. 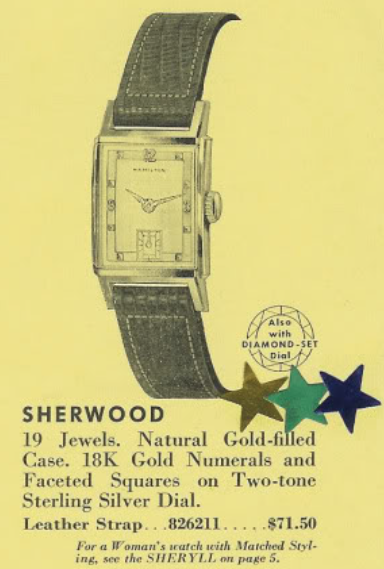 In 1950 Hamilton introduced the Sherwood, it was the second time the name was used. 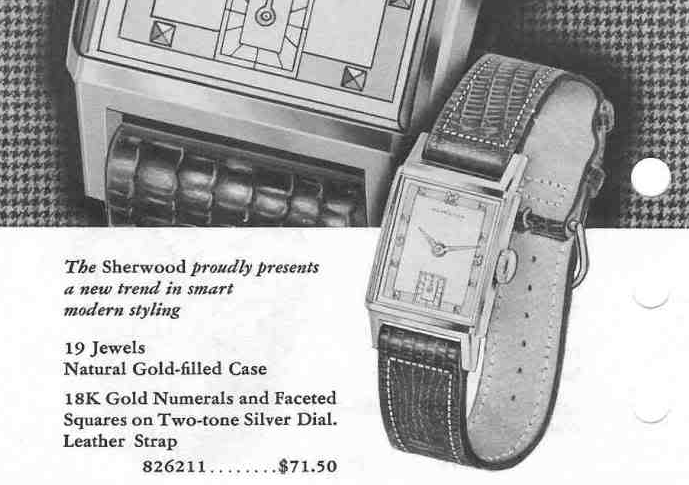 The first Sherwood was made in 1935. Anyway, the 1950 Sherwood was produced for three years. The Sherwood came in a 14K yellow gold filled case with a 19 jewel 982 movement. 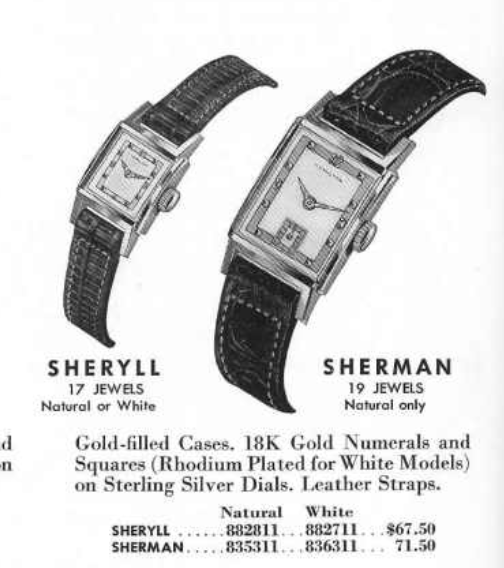 In 1952 the Sherwood catalog made mention of the matching ladies version, the Sheryl. The Sheryll looks like a miniature version of the Sherwood. 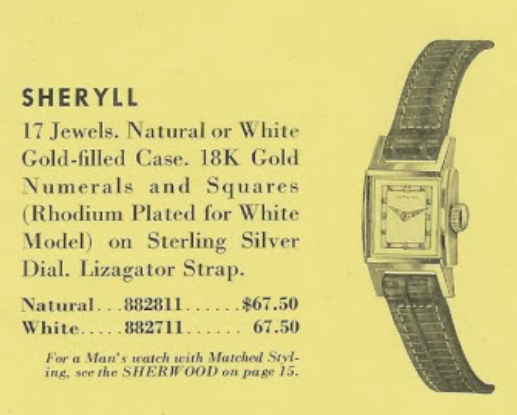 Unlike the Sherwood, the Sheryll also came in a white gold filled version. 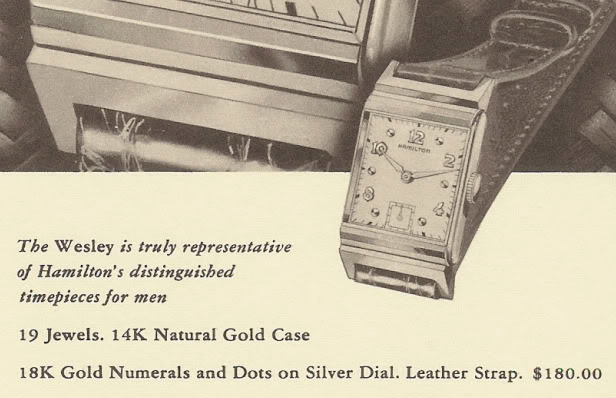 Well, along comes 1953 and with it the introduction of the 12/0 sized movements. A lot of "-B" models arrived on the scene as a result. So what does Hamilton do? 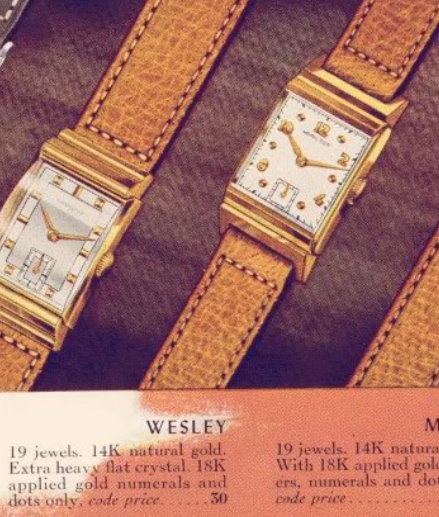 They introduce the Sherman... a 10K gold filled watch that looks exactly like the 14K gold filled Sherwood. Tucked inside is the 19 jewel 753 movement. So I guess if the movement AND the case material changed, then the "-B" doesn't apply and it's a different model altogether. With the arrival of the Sherman, Sheryl becomes a two-timer and is paired with the Sherwood's younger brother. Now both models are offered in white gold filled too. The marriage wasn't meant to last though, as the Sherman was made for only a single year. I happened upon a Sherman in need of love. I thought it looked familiar but at the time I didn't realize it looks identical to the Sherwood. As received, the crystal was all beat up so it was clear, pardon the pun, that a new crystal was needed. Without the bezel and crystal in place, it doesn't look much better. I'll try to clean up the dial but this one looks a little too far gone. The 753 was a precursor to the 770 that would be introduced in 1955 and replace all of the 12/0 grades. The 753 shares a lot of parts with the 770 but one of the main differences is that balance does have shock jewels. While I'm at the Sherman, I'm going to also restore it's mate, the Sheryll. I happened upon this shortly after getting the Sherman. The seller's photos where terrible and it turned out the watch is a white version, and not yellow as I had perceived from the seller's photos. Oh well, vive la difference! Like the Sherman, this Sheryl's crystal was beat up too. Without it in place you can see the dial is in fair shape, a little cleaning will make it brighter. It's tiny by comparison and smaller than a Dime. The grade inside a Sheryll is the 17 jewel 21/0 sized 750. Other than the fact that it's tiny, it's basically the same thing as the men's models. You know what they say about a man with big hands and big feet? He needs big gloves and big shoes. Tiny movements need a tiny movement holder. While all the parts take their turns in the ultrasonic, I'll prep two new glass crystals to go into their respective cases. I got my dial refinished... that was "fast"! I had this project in mind since last November and finally got around to it. The Sherman is the first to be ready for reassembly. It's running vigorously, that's a good sign. Now it's off to the timer. There are some stray dots below the bottom line. Something inside is making some noise. The time keeping is good but the noise is bothersome so I'll try to get rid of it. I wish it was as easy as just taking another photo - but after much trial and error, I had to remove the balance, replace the regulator, and adjust the beat error in order to get it to run cleanly. There's nothing wrong with this watch's timekeeping now. With one down, it's off to the Sheryll. If you're a hobbyist like me, when you think you know what you're doing you should try to tackle one of these ladies movements. You will be reminded of Michelangelo's quote from when he was in his 80's... "Ancora Imparo" I am still learning. The tininess of the parts presents an all new challenge. To give you an idea of the size of the these parts, check out the gear train below compared to my index finger tip. Getting the pivots of all four wheels to line up in their respective jewels of the train bridge can drive you to tears. Success - the watch is running nicely and it's placed on top of the timer. This movement is so small that you have to be extremely careful not to drop it, or accidentally break the balance wheel. A little tweaking to the regulator brings the timing in line. The extra dots are me poking the regulator. The beat error is a little high but there is no way I'm going to fuss with the hairspring on this balance. Here are the two watches, reassembled and tucked safely within their cases. You can see by the time difference of the dials that it took me about 25 minutes to assemble the Sheryll since I put the hands on at 12:00. I'm not a big fan of the 10mm expansion bracelet on the Sheryll so I'll look for a new strap for it. In the meantime, I think these two watches turned out very nicely.